With Valentine’s Day and Brady’s (FIRST!!) birthday all this week, I’ve been scouring Etsy and blogs and every cute little shop I know to find ways to make these occasions extra special. I truly believe it’s possible to give precious gifts, host adorable parties and delivery beautiful, personalized packages without breaking the bank. You just have to know where to go to find the extra cuteness. Brady’s first birthday party is on Saturday. It’s “bow tie” themed. Perfect for our little southern gent. I cannot WAIT to share his adorable invitations and all the details from his party this weekend very soon. I’ve made most of the decorations by hand and ordered about 95% of my supplies from Etsy. But, his celebration isn’t just on Saturday. On Thursday and Friday his daddy and I have a few extra special surprises planned. I’ve put so much thought into every detail of this week and can’t wait for everyone to be here to celebrate our little man on his big day. There’s just something so special about adding a cute, unexpected tag here or a thoughtfully placed label or sticker there. My Mom used to write me a note every day and place it in my lunchbox. I remember being so excited to read her note when I sat down at the lunch table. Sometimes it was written on a post it. Sometimes it was a card. Sometimes it had a sticker. But the message was always sincere and encouraging. Every since then, I’ve had a fascination with the cute little easy-to-do details that make even the most basic thing a little more special. Above are a few of my favorite finds while packaging special “things” for this special week for my special boy. Enjoy! 1. Washi Tape from Bahana Splits Boutique on Etsy. Only $15 for ten feet of each pattern. I love washi tape for so many reasons. It feels like fabric – so handmade and gives a really special touch to any package. 2. Twill Ribbon from Olive Manna (LOVE Olive Manna) Just $8 for five yards of your choice of 20 colors. This color palette is delicious. I love how natural twill ribbon looks. Also check out the rest of Olive Manna’s packaging. I love everything. Especially the rubber stamps. 3. Kraft Heart Stickers from Knot & Bow on Etsy. 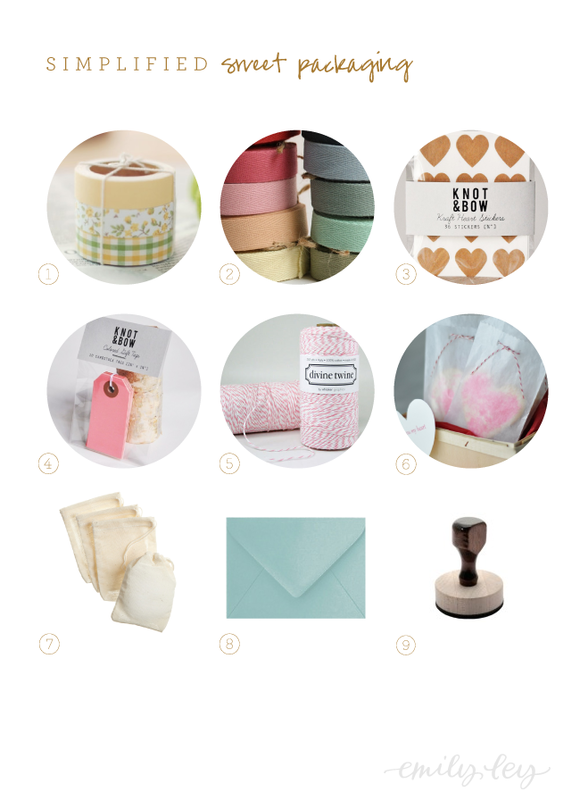 Knot & Bow is one of my favorite go-to packaging shops. Super easy, great customer service and adorable options. Imagine how much fun you could have personalizing these! These are only $4 (including shipping!) for 36. 5. Cotton Candy Pink Divine Twine from Bahana Splits Boutique on Etsy. Love, love, love. Baker’s Twine can be used for so many things. I purchased yellow and white Baker’s Twine for Brady’s birthday party. Here you can purchase a variety of lengths (in many lovely colors!). The full spool is 240 yards for $14.25. 7. Muslin Bags from Amazon. You can get these just about anywhere, but they are SO much fun to personalize. All you need is a rubber stamp or a sharpie and a steady hand. They make cute favor bags and are especially adorable when screen printed. These are just $4.05 for four bags. 8. Colored Envelopes from Paper-Source. Colored envelopes make any note better. Period. Paper-Source is a great place for a variety of colors and has the best quality around. Check out their wholesale side Waste Not Paper if you have a resale license and are interested in ordering in bulk. Thes are just $3.25 for ten envelopes (retail). 9. Rubber Stamp from Rubber Stamp Champ. I’ve worked with Rubber Stamp Champ a lot and they do an excellent job. I so love the quality of their stamps and how easy it is to design something in Illustrator, save it as a JPEG, upload it to their site, purchase and be done. Easy peasy. Their prices are great too – they range from $3.99 + and include free shipping with orders over $10. And there you have it! Where are your favorite places to buy small quantity packaging items? Off to finish planning for Brady’s birthday week! !